Make new friends, level up your skill, and compete in our end of season tournament at our Magic: The Gathering Arena workshop, presented by The Society of Sorcery: a new card game & tabletop RPG club for high school students at the Game Gym. March 9th – Session #1: Deckbuilding and Archetypes – Learn more about the different ways to build and refine your deck! March 16th – Session #2: Limited Resources – What are the resources we have at our disposal to win games? What might you not have considered a resource yet? March 23rd – Session #3: Tempo 101 – What is “tempo”? Can we manipulate time itself to our advantage? March 30th – Session #4: Tournament Preparation – Learn how to “meta-game” to build your best deck to the biggest events. We will also talk about keeping your cool in tournaments and high-pressure situations. April 6th – Session #5: The Grand Tournament! – Put your new knowledge to use in our culminating tournament for prizes and bragging rights! Players MUST attend at least 1 of the prior sessions to be eligible for competition. This program is TOTALLY FREE, but you must register to guarantee your slot in the program. Participants may register for as many or few sessions as desired. Class slots will be distributed on a first come, first serve basis. Please email all questions to program Coach Mike Zacek at mjzacek@gmail.com. Magic: The Gathering is a strategic card game in which players assume the role of a “Planeswalker”, a mythical sorcerer unbound by space and time who summons ferocious creatures and devastating spells to eliminate their opponent. Players build decks of cards with an assortment of their choice of creatures, spells, artifacts, and weapons, with “land” resource cards like islands and mountains to generate the “mana” to cast them. One player’s deck can be very different from another, and it’s not unusual for a player’s deck to have part of their personality injected into its design. One player might build a deck designed to summon mighty dinosaurs to stomp all over their opponent, while another may prefer slower, more calculated spells that seek to control the game and outwit (rather than out-brute) their enemy. When the first player’s life total hits 0, it’s game over, and the remaining Planeswalker is declared the victor. The “Society of Sorcery” Magic: The Gathering club kicks off on Saturday, March 9th. Missed the first session? No sweat! Registration is open and free for the duration of the program. Simply follow the link www.bit.ly/GameGymMTGA for more details! We’re excited to introduce Mike Zacek as the program coach for “The Society of Sorcery”, a Magic: The Gathering & Tabletop RPG club here at The Game Gym! Coach Mike is an avid card game player and local gaming community leader, running Hearthstone (a similar digital card game) social events and recently transitioning to Magic: The Gathering Arena events in Fairfax, VA. 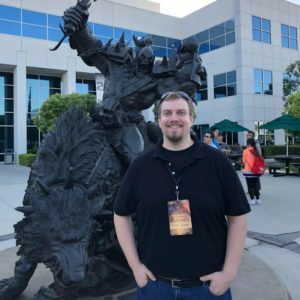 He was recently invited by Blizzard Entertainment to the “Innkeeper Summit”, an international conference for grassroots Hearthstone community leaders in Irvine, CA, where he presented as a guest speaker on the topic of using local gaming communities to reach out and engage gamers who struggle with social anxiety. Coach Mike graduated from the University of Michigan in 2012 with a commission as a Naval officer through their NROTC program. His background in youth and young adult development initially began in ministry programs in southeast Virginia in 2013, before moving up to Northern Virginia in 2016 and aiding George Mason University’s Catholic Campus Ministry as a volunteer in student and staff leadership training workshops. Currently, he lives in Reston, VA and is working as a business analyst contractor for the Federal Trade Commission’s records and information management office. “I love working with youth and getting to contribute to building their confidence in themselves as they develop into young adulthood. My goal with creating the “Society of Sorcery” Magic: The Gathering club is to provide opportunities of socializing, discipline, and challenge to high schoolers who might feel more at home around a tabletop game than on a basketball court or soccer pitch. When I first met Coach Josh, I clicked immediately with his vision for what The Game Gym would provide the local community and have been bugging him for months to be a part of it. I believe every single high school kid ought to have the opportunity to join a community of likeminded peers, and we have an incredible opportunity to create some lifelong memories and friendships for them here with this new program”. What do the following situations all have in common? After moving into their first house, a newlywed couple seeks to throw a housewarming party for their new neighbors. A team of young scientists consider the results of separate studies that suggest contradictory conclusions. The CEO of a Fortune 500 company is staring down potentially significant market share disruption after a major innovation announcement by a competitor. As wildly different as the above situations are, the mode of thought that all our actors must engage to succeed is the same: what we’ve come to call “critical thinking”. For the purpose of this article, we will define “critical thinking” as the ability to determine the best course of action in situations that involve highly complex, incomplete, or hidden information in independent, collaborative, or competitive environments. In all the above scenarios, our actors are faced with situations involving complex, incomplete, or hidden information – but they still had to come to decisions and act without knowing exactly what the outcomes would be. The young couple doesn’t have the benefit of knowing all their guests’ food, music, and entertainment preferences. The scientists must discern what their key missing data and information is and how to best move forward and obtain it. And the CEO – even with the best market research, analytics, and projections – still must make difficult, subjective decisions under immense competitive pressure to lead the company in the best new direction possible. I am a huge believer in practicing consequential skills in non-consequential environments, and card games like Magic: The Gathering are among the best hobbies for training critical thinking. Card games are unique in that their patterns of play are not based around gamer stick & button reflexes, but rather around pure strategic decision making in an ecosystem of highly complex, incomplete, and hidden information. (I highly recommend reading Magic: The Gathering, A Primer for Parents if you’re unfamiliar with the game). Players build decks of cards consisting of fantastical monsters, spells, and special artifacts and weapons. Both decks are shuffled before every game and players draw their opening hand of cards, concealed from their opponent until played. Players must then consider their strategy based on their own deck’s random draw and their opponent’s probable (yet unknown) gameplan, adjusting on the fly as needed to the cards they and their opponent draw and play. These traits give us not only the portrait of a Magic: The Gathering champion, but of a future leader of tomorrow’s generation. Whatever your child’s aspirations are, whether they want to be an electrician, CEO, project manager, scientist, beautician, or President of the United States, I believe there is no skill more important to develop today than this version of critical thinking. Many of their peers will mature into adulthood too afraid to take risks in the face of uncertainty, complexity, and competition. My dream is to provide an opportunity through Magic: The Gathering to forge a little bit of that courage, curiosity, and resilience. Who knows – maybe slaying paper dragons today is your child’s first step to slaying the giants of business and industry tomorrow? The “Society of Sorcery” Magic: The Gathering club kicks off on Saturday, March 2nd. Missed the first session? No sweat! Registration is open and free for the duration of the program. Simply follow the link www.bit.ly/GameGymMTGA for more details!